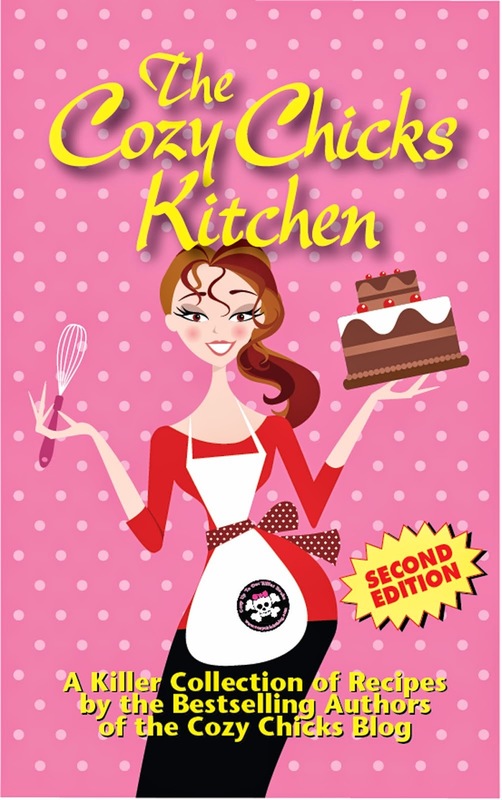 Cozy Chicks: Would you like some? 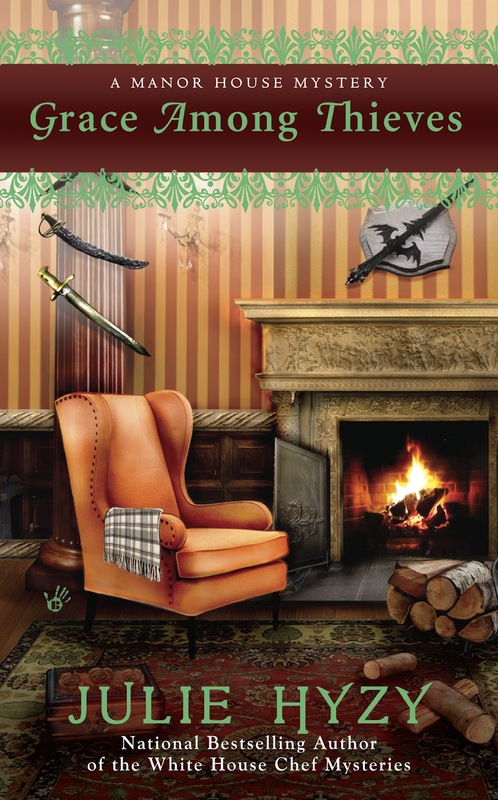 I'm super excited because the bookmarks I ordered for GRACE AMONG THIEVES have come in and they're so pretty I want to share them with everyone! As I'm sure you know, postage keeps going up and it costs the same (45 cents) to mail one bookmark as it costs to mail five. So... with that in mind, I'd like to offer you bookmarks, if you'd like them. There are a couple of details to keep in mind, though. First of all, U.S. addresses only, please. Second, if you'd like these bookmarks, please don't leave your address in the comment area below (we don't want personal information getting out!). 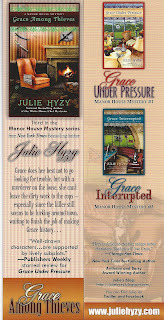 Rather - email me at my name - Julie Hyzy - (all one word) at gmail.com. And... lastly, because I always get very odd requests from faraway lands from individuals (and sometimes companies) who probably have no interest in reading, but take anything offered for "Free," I'd like to ask that you include in your email a quick sentence about what/who you like to read. That way, while I'm addressing envelopes in front of the computer for hours, I'll get to know you a little bit better. That's always fun. Five bookmarks will be the minimum I'll send - with the hopes that you'll share the extras with reader friends. If you'd like more than five - say you're in a book discussion group, or your local bookstore or library would be willing to distribute them - let me know, and I'll be happy to accommodate. 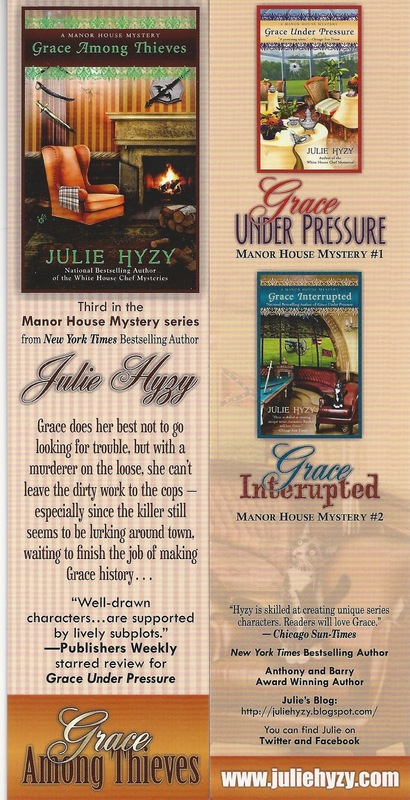 Grace Among Thieves is the third (and so far, my favorite) in the Manor House series. It's due to debut on June 5th and I'll be launching it at Printers Row in Chicago. More details on that to come. But for now... email me with a few words about your reading habits, and I'll send bookmarks to you ASAP! I am very sorry to read that you don't ship abroad. 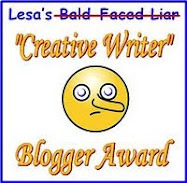 I saw a Tweet by Ellery Adams last week about your bookmarks, and sent you an email. Did I overlook on your Facebook page that you only ship US? I love cozy's and bookmarks of the books I read. I will absolutely send some to you, Aurian. I put that disclaimer in because last time I offered free bookmarks, I received nearly a hundred requests that looked as though they were auto-generated from the same locale. I'm *always* happy to mail to real readers, but I prefer to avoid sending to "bots." 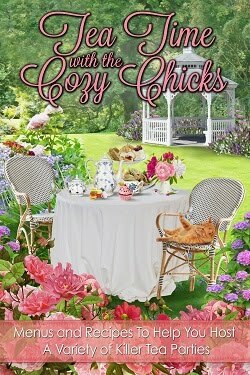 Thank you :) I hope to get to your books soon, but still have some "full time" cozy chicks to finish reading first :).